The grinding struggle that has caused such suffering by Israeli Jews and Palestinian Arabs is pictured in searing human terms in ARAB & JEW: RETURN TO THE PROMISED LAND. Written and narrated by Pulitzer-Prize winner David K. Shipler, this program taps the powerful yearnings of two peoples as they pursue and preserve their nationalist goals of returning to their historic land. 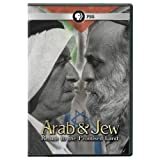 Combining new material with interviews of some of the same Israelis and Palestinians that appeared in its award-winning predecessor, ARAB & JEW: RETURN TO THE PROMISED LAND illustrates both unchanging views and an evolution of attitudes by Israelis and Palestinians from before and after the Oslo peace process. This program is a journey through the psychological landscape where Arabs and Jews meet. By allowing both Palestinians and Israelis to explore their own attitudes, the film searches through their minds and emotions for the points of conflict and the regions of accord.